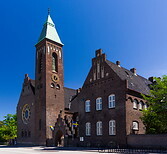 The Swedish Gustaf church (Swedish: Svenska Gustafskyrkan) is the church of the Swedish congregation in Copenhagen and was built between 1807 and 1911. The St. Alban's Anglican church is located adjacent to the Kastellet and was built between 1885 and 1887 for the growing English congregation in the city. 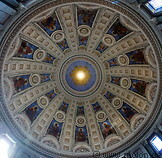 The Frederik's Church (Frederiks Kirke) also known as The Marble Church (Marmorkirken)is a rococo Evangelical Lutheran church near the Amalienborg palace built between 1740 and 1894. The Church of Our Saviour (Vor Frelsers Kirke), built between 1682 and 1752, is a baroque church in Copenhagen famous for its corkscrew spire with an external winding staircase that can be climbed to the top. St. Paul's Church (Sankt Pauls Kirke), built between 1872 and 1877, is a Lutheran church in central Copenhagen also known as Nyboder's church.